November 2015, the first season of dirty2ride ends, I begin planning the next, looking for inspiration on the Internet and mountain bike forums. 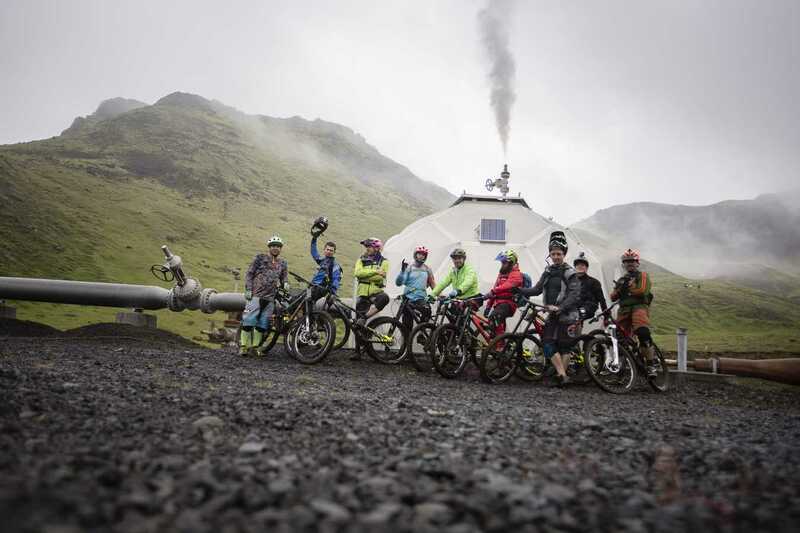 I accidentally stumble across a fantastic advert, in which icons from the MTB world Hans Ray and Steve Pat are conquering Iceland; my first thought is I must be there! I craved the same feeling, however considering the fors and against, I concluded that it is too early to plan this reasonably. 2017 was the perfect time to uptake this, so I began gathering information about Icelandic trails. Dirty2ride is my youngest concept. However, we have so far accumulated vast amounts of experience. After two years we have travelled through Scotland, conquered Wales, the Italian Lake Garda did not cause us any problems as well along with many other European destinations. Still, Iceland was a whole new monster. It is the land of fire, ice, extreme winds and sandstorms, the house of many active volcanoes and melting icebergs. You cannot travel there without preparation; planning was key to success. I obtained most of the knowledge on MTB forums. Also, I met up with people, who have travelled there before me. They shared their experiences and gave me priceless advice. Considering all of these I decided to enter Iceland into the calendar for July 2017 and genuinely think this is the best time to conquer this beautiful country, on enduro bikes. From the get-go there was one condition; we are not travelling without a photographer. Rysiek (ryszardzaleski.com) came up with the idea to propose Zumbi Cycles as the patron of this adventure. Having a personal relationship with the founder, remembering times when Pawel used to assemble bikes in his garage. Right now it is a huge brand, trying to compete in the world of MTB. 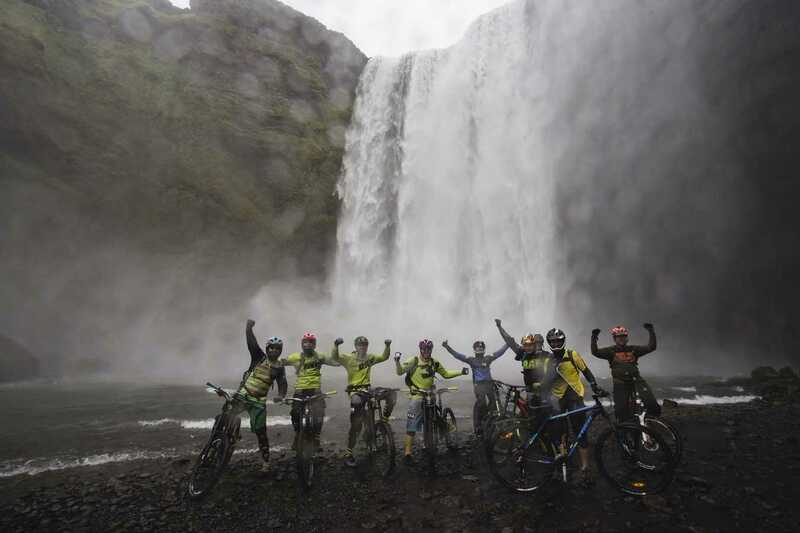 WE were proud to explore Iceland on a bike from our home country, Poland. 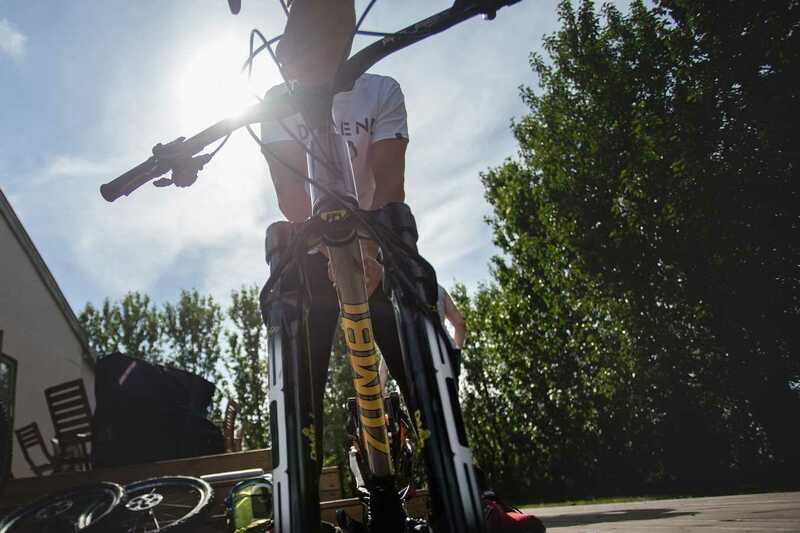 Zumbi proposed us their flagship model Enduro: F-11 650B. At that moment I had everything, but no crew. I put out the post onto our FB page, and within half an hour there were no more spaces left! Surprise? I don’t think so, as the magic word Iceland was finally said. Everybody wants to be there, but not many people can go there. During our travels into the unknown, we had only one thing to rely on, ourselves. We carried out thorough checks on our companions and decided that the first attempt has to include the veterans of D2R. Only the strongest characters, unconditional friends, great personalities and most of all great riders. We all had each other’s backs! Together we came to a decision that we are beginning our journey in the southernmost part of the country, hoping to find MTB paradise. 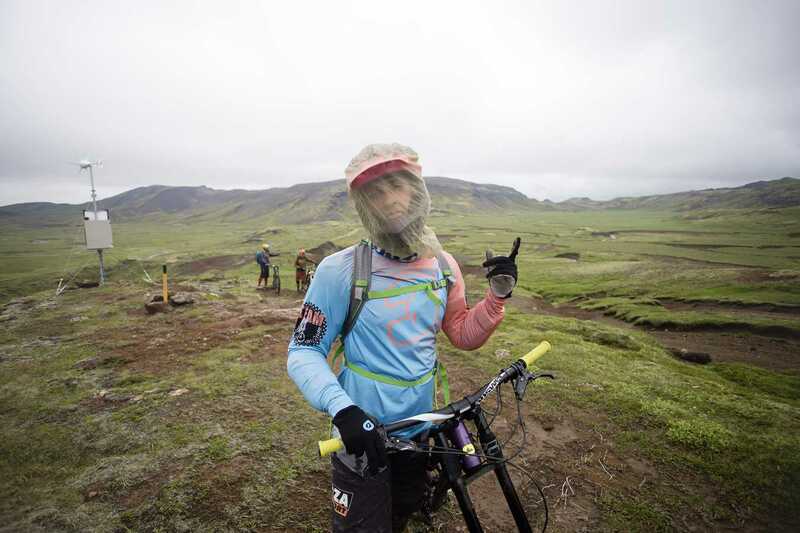 Amongst others in the south, one can find volcanoes, glaciers, hot spring and long stretches of singletracks in beautiful scenery. July is the time in Iceland when day wins over night; it never gets dark! White nights, allowed us to cover more ground than ever before. However, as soon as we landed something seemed wrong. It turned out that Reykjavik in July 2017 was not a friendly place; foggy, cold and misty with a temperature of around twelve degrees celsius. It did not make us optimistic. Moreover, during our journey to the first campsite, the weather changed multiple times. Across one hour, it was possible to have all three; rain, fog and sunshine. New dawn – Snaran. At first glance, it seemed as if we were back in Scotland, so very close to home. Driving on the grated gravel, and with each kilometre passed we can see that this has less and less to do with Scotland. The ground suddenly becomes soft, and we are no longer able to drive. Time to mount our horses and begin the climb. A mere hundred metres change in elevation and the scenery changes drastically. The grass disappears, making way for brown canyons and views out of this world. The F-11 is rushing to climb – first impressions, amazing. 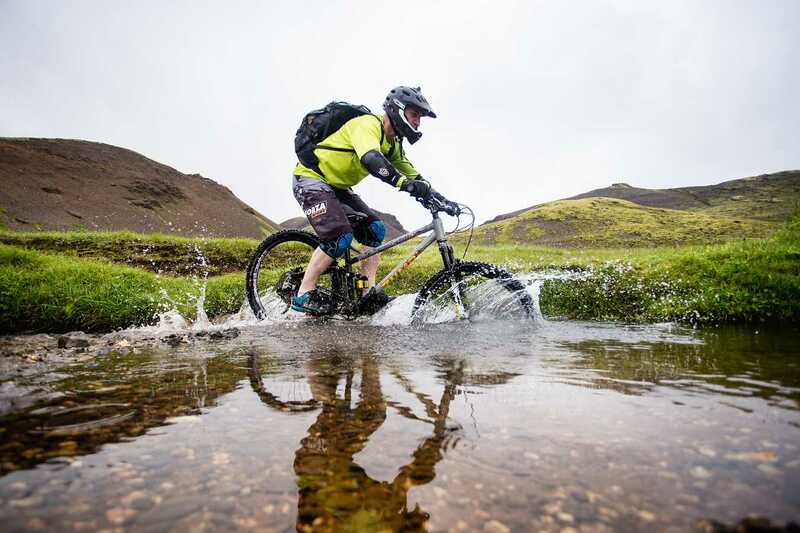 The Icelandic water has carved the rocks and with such views the joy from riding tenfolds. For the first time in our lives, we ride in such mystical conditions. The route meanders down slowly giving us immense pleasure, but after a while, it becomes so steep that further biking is not possible. Bikes on our back, and down we go! Luckily after a while, we are riding. This time parallel to the river. Amongst all this happiness, we do not realise that with each kilometre we are getting wetter, it did not disturb us at all! The surroundings and places we are travelling across recompensate for the chill and tiredness. The prize of the day is the final descent, five kilometres down a fantastic singletrack. Tired, but hugely satisfied we pack the bikes onto the van and return to our base, for some still fresh opinions on the long first day. Steamer, day two. Outskirts of Reykjavik. The name suggests that we will be travelling along hot springs, Iceland’s claim to fame. The weather drastically improved, around 16 degrees, no fog. We charge our batteries during a substantial breakfast. Today we have to travel 20km with a 1000-meter climb; it will be a lot harder than yesterday. We set off to the starting place; we can smell the sulphur on the way and see numerous geysers. The route begins slowly along some tarmac, which after the first few hundred metres, starts to rise rapidly. With each metre climbed, our muscles warm up. The scenery begins to change, surrounded by geothermal generators, we realise this is not an everyday sight as if we were on a moon base. An hour passes, and we are far from the start, climbing steadily on the beautiful singletrack, but the calculations show us that there is still a lot of climbs left. In the distance, an array of hot springs appears to be crossing our path. In picturesque, unearthly scenery, time passes quickly. The route begins to climb yet again, now littered with warning signs; we are not on safe ground. The temperature in the springs is around 100 degrees, and the smell of sulphur begins to irritate. A quick photo-shoot and off we go. After a while, we are in a safe place, and the steam rises behind us in the distance. A quick stop and time to climb again. This island never forgives. Once again Iceland begins to attack. This time insects they are everywhere, and mosquito nets become essential. In the distance snow; maybe the insects will give up. Another hour passes, and we reach the summit, we cannot go any higher. With our heads above the clouds; the visibility drops to a couple of metres. The GPS becomes essential, helping us to navigate precisely. We find the trail but discover it lies beneath a sheet of white snow; it doesn’t matter as long as the direction is downwards. Zumbi is doing great. With ease, it descends the snow. The gradient is not high, but the 27.5-inch wheels are doing great. Not even snow can stop us. The gradient begins to increase, as the F-11 is building speed, it starts to show its qualities. It is amazing! We only have one specimen. But everybody wants a go, to feel its fantastic downhill geometry. We leave the trail behind us and descent quick. Surroundings turn green again, and we in a madness of joy; forget the hardships of the climb. Natural obstacles become a source of pleasure. With every jump, our energy rises, and every twist and turn allows to reach higher speeds. As we approach the end, all of us can tell that this was the hardest ride of the year, but we managed! As the organiser of this event, I can pat myself on the back. My job is done. As the excitement falls, tiredness begins; everybody is dreaming about rest. We set on the way home for some much-deserved dinner. The night is gone! The time is 23:00, we are heading to the natural hot springs of Reykjadalur. It is a mere 30-minute drive from ‘home’ and everybody attends, in the hope of using the natural hot springs. The clocks tick past midnight, it seems as though it is only late afternoon. As we walk towards the springs, nobody else is around. Not an everyday situation but this is no problem to use. We are all excited to indulge in and rejuvenate the body after the hard day. Day three, we move our base to Vik. Today we decided it is time for some rest, this, however, does not mean we are not on the move; we have around 700 kilometres to travel by car. With plans to ride along the glacier, and see the famous Diamond Beach, the excitement begins to flood the air. 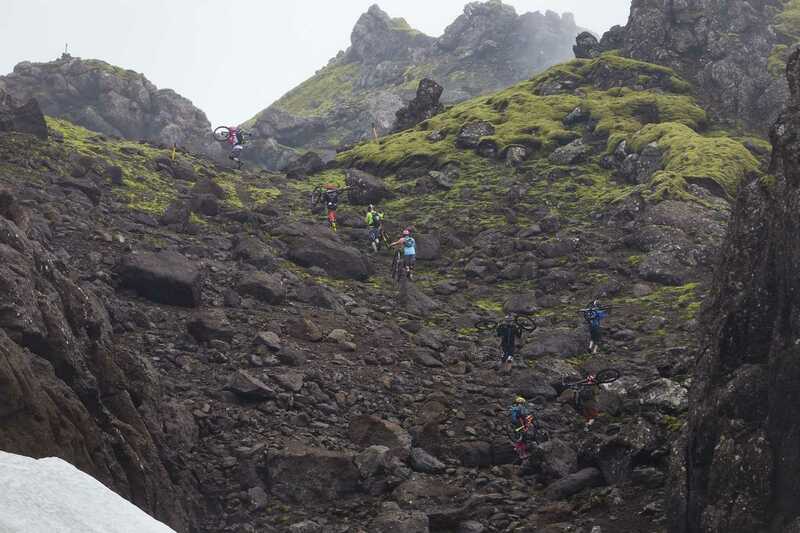 Route no.1 gives Iceland some life. A ring road around the whole island allows for quick transport. Alongside the way, we find all the attractions. After travelling many kilometres, we arrive at the first spot; black beaches made up of volcanic rock. They are an incredible attraction, but we are all looking forward to the glacier, so we quickly return to the van and carry on our journey. We arrive in the late afternoon to the glacier. We cannot see it, but the chill in the air alerts us to its presence. 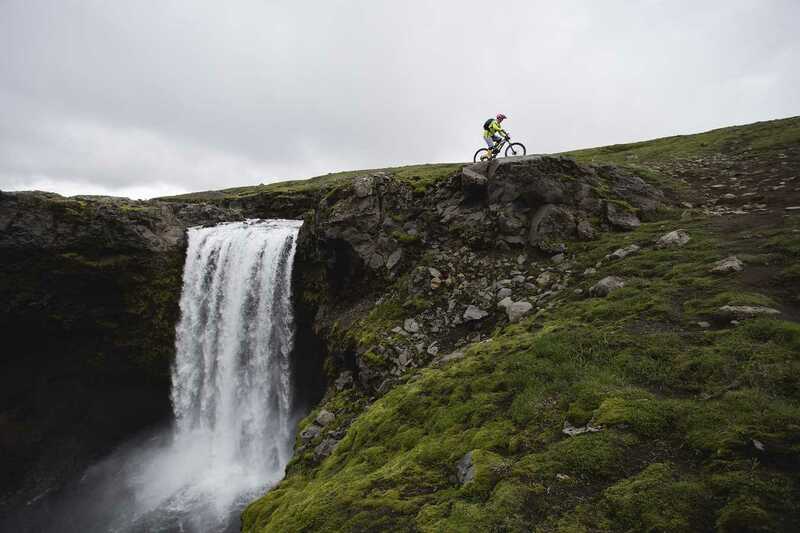 We climb on our bikes and head towards the foot of the glacier. A huge fiasco greets us; the ice has disappeared. Only the drifting icebergs, which slowly drift towards the ocean. Disappointed, to say the least, we take our final pictures and head towards the van. As we turn around, I begin to wonder whether there is the possibility of encountering good weather on this island. Reluctantly we turn our heads towards it one last time, and suddenly the whole situation changes. Clouds begin to drift away, and the tongue of the glacier slowly emerges. Svinafellsjokull; in simple translation it means pig’s tongue. The aura did not allow us to see it in its full glory. Nonetheless, our spirits were raised. We journeyed further towards one of the biggest tourist attractions, diamond beach. After arrival, we stood there observing the blocks of ice like orcas observe ships. The views are spectacular! It is late, but that never stops us from going off the rails. In a desire to jump off the icebergs, we find the best candidate and proceed to drop off it. The drop allows us to understand the true meaning of diamond beach. Surrounded by pearls of ice we feel like the wealthiest people on Earth. These icebergs do look like the diamonds from Tiffany. Midnight is long behind us, but another 400 kilometres of road left, we return home in a flurry of emotions. Today there is no more planning. As everyone slowly settles into sleep, my eyes remain firmly on the road. They have no idea what is coming tomorrow. 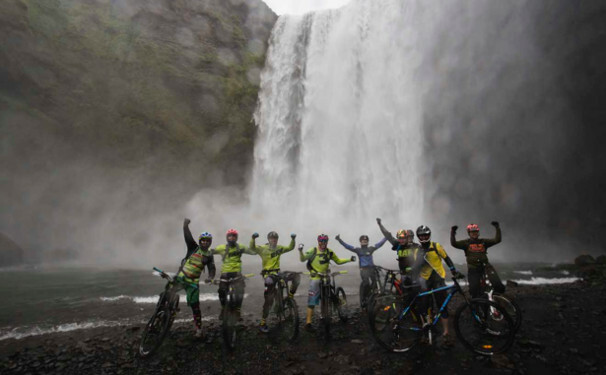 The trail that Hans Ray and Steve Pat inspired me with to go to Iceland, which attracts MTB fanatics from all over the world. The grand finale will consist of a tough 20-kilometre climb followed by a 10kilometre descent. The time is 8:15 a.m. and the last day is ahead of us. The weather spoils us completely. It is a beautiful Sunday morning; the sun slowly heats up the area, it is time to get on our bikes. The climb begins on a hard rock road, which meanders in between the volcano Eyjafjallajokull and the glacier Myrdalsjokull. It starts as always, tough. The slope is more than 15%. 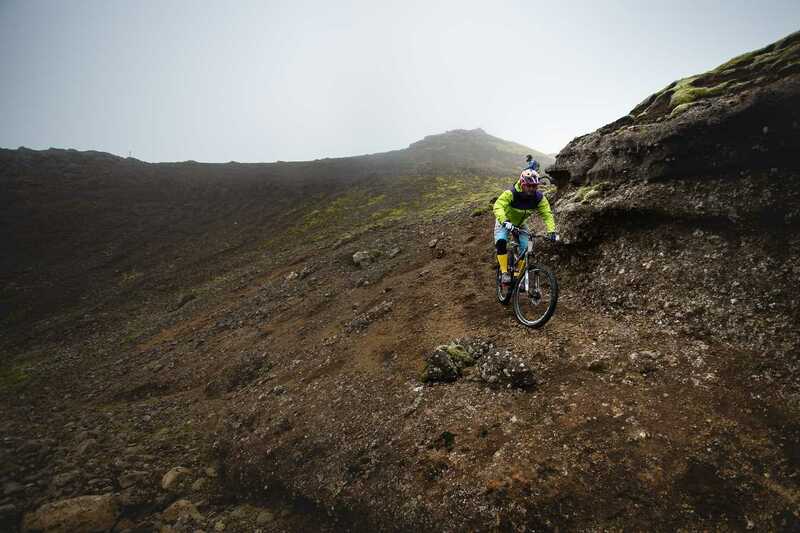 However, this is no obstacle for the F-11, which not only excels at descents. It is also a very accomplished climber. On the final day, it is my honour to ride this bike finally. First impressions – no impressions. It must be good. How good? Only a matter of time before I find out. It is hard for anyone to keep up the pace with me. I am climbing rapidly, as I wait for the others I have some spare time to take some private pictures and wait for the rest of the convoy. Ahead of us, we have the glacier, on our left is the volcano and all around us, water. It truly is breathtaking. The hum of the water begins to rise with every metre climbed. Small waterfalls surround us. The climb becomes uncomfortably comfortable towards the top, the waterfalls do not impress us as much as they did at the beginning but they are a sight to behold. As we reach the summit, it is time for some well-deserved rest. Consuming all of our food, a quick nap and of course a quick photo shoot we regenerate our strength. After all these pleasures we proceed to the heart of this expedition, the 10-kilometer descent down the natural singletrack. This time I am not letting the Zumbi leave my hands! The journey down begins across huge rocks, which is 100% rideable. As we gain speed, the ground becomes typical for what you expect from an island. A thin brown line surrounded by neverending green. This brown ‘line’ gives us endless joy as it begins to steepen. We are descending fast. Suddenly, a loud roar greets us in the distance; it is no longer the calming hum of the water. Around the corner a huge waterfall emerges; it is incredible, as always we proceed to take a couple of photos. But in all this distraction we do not forget about the descent, after all, this is the main attraction of the day. With every passing second, the trail gets better; It is undoubtedly the best we have come across in this country. I am leading the expedition on my Zumbi, we are beginning to create quite a duet, and my feeling towards it has warmed up significantly. In this heap of emotions, I am no longer sure of what I want, to observe the scenery or to ride my bike hard. Nonetheless, as I turn my head to look behind me, I see the boys going down in single file. The lightness at which we are going down; the pleasure we all experience, allows us to forget all those moments of resignation, exhaustion and anger. More tourists crowding our path serves as a painful reminder that this is the end. Arriving at the Skogafoss waterfall; we take one last look at the falling water, the sight which attracts millions of tourists every year. Be that as it may, standing at the bottom of the waterfall, a feeling of wilderness comes over us. 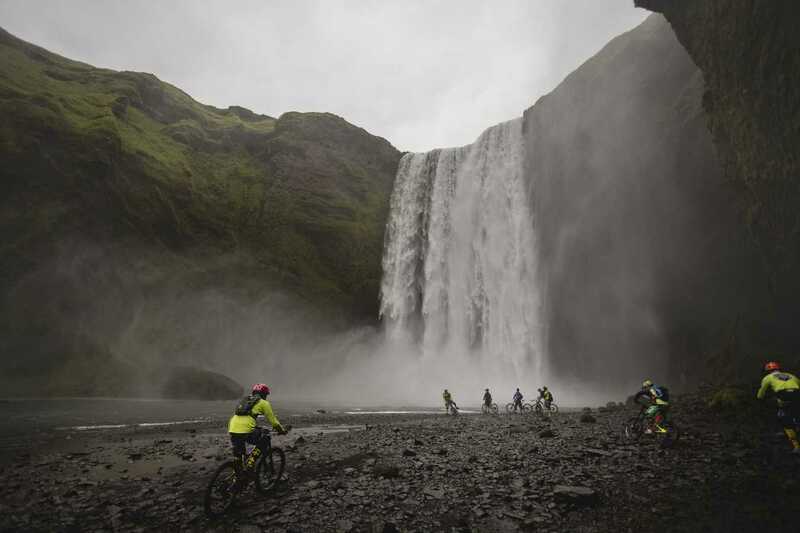 We proceed to climb aboard our bikes one last time and ignoring everything else ride into the heart of the waterfall carrying out our dance of joy! Katharsis! Just like that, something that only a few years ago seemed like a distant dream, becomes history. Mission Completed!